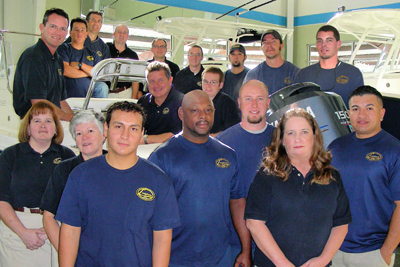 The Mission of Longshore Boats is to build rewarding and lasting relationships with our customers while consistently providing exceptional service so that they may enjoy the waters of the Lowcountry and enhance their quality of life. Yamaha warranty until 2014. Low hours, Raymarine E120 GPS/Chart Plotter/Fish Finder, Raymarine 54 VHF, A/C Reverse Cycle 5000 BTU, Bow Rail w/ Powder Coating, Cabin Cockpit, Hull Color: Stars & Stripes Blue, Power Assist Steering, Clarion AM/FM/CD w/ 4 JL Speakers, Fold Down Stern Seat, FRP Hard Top w/ Spreader Lights, 4-Sided Enclosure, Trim Tabs w/ Indicators, Windlass w/ Rode, Windshield Wipers, 2 Deck Chairs. Well-Appointed at $129,900!